Enigmatic by nature Pontoh’s Pygmy Seahorse fits like a puzzle piece into the drifting, moving, swaying landscape of her hidden hydroid home. She appears fragile with a figure the dimension of my thumbnail. Yet, she moves with relative confidence and ease. Her twiney tail wraps tightly around the base of one hydroid, before she pushes off and moves in one great leap of her tiny frame, tail grasping the next hydroid base to tightly anchor once again. 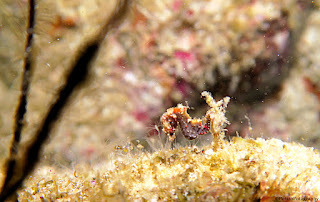 Found beneath the shelter of the wreck she is well hidden from potential dangers of ocean currents and predators as she nestles into her home. Her creamy beiges and browns mirroring the mossy world which she inhabits, difficult to spot by divers and predators alike. With no teeth and no stomach she must constantly prey on the tiny crustaceans and planktonic organisms. Watch long enough and you will see, a teensy snout protrude to slurp up her tiny prey. 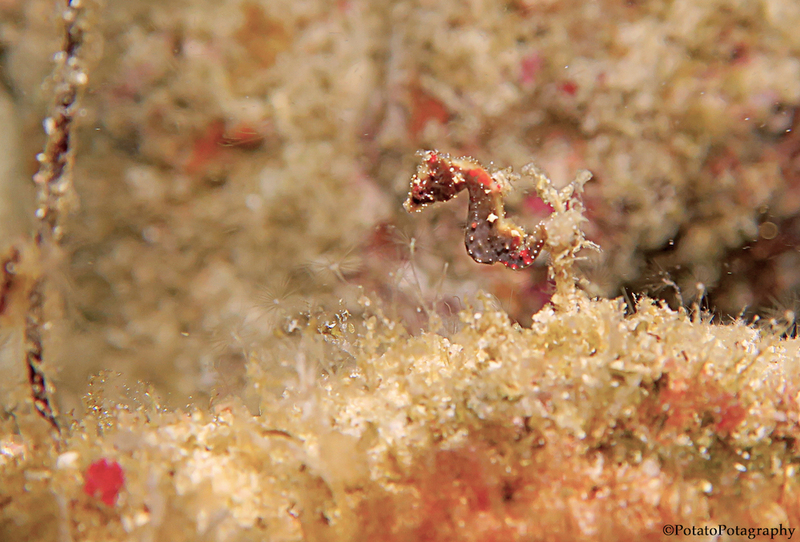 This charismatic creature, also called the weedy pygmy seahorse, was only discovered in 2008. Once again, the small Island of Pom Pom and TRACC has been privileged with rarity and majesty in a diminutive form.